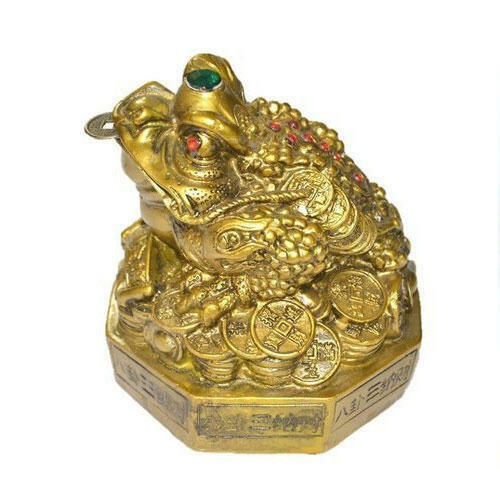 Feng Shui Money Frog with ingots & coin in its mouth. It is known to improve cash flow. It is symbolic of monetary gain & wealth. The Ostara Shop is a partnership based company that was emerged in the year 1999 at Bengaluru in Karnataka, India. We are a renowned company in the industry that has been Distributing, supplying, trading, retailing and exporting a huge range of product that includes Essential Oil, Essential Oil Diffuser, Laughing Buddha, Feng Shui Products, Singing Bowl, Gemstone Pendulum, Himalayan Salt Tea Light Holder, Acupressure Products, Crystal Angels and many more. Offered products are manufactured in compliance with the international quality norms and standards. We export our products to all over the world. Also, we use high grade material and sophisticated technology in the manufacturing process of these goods. Our professionals keep customer’s demands and requirements while providing and manufacturing these goods to our respected customers. We are a client centric company that is why we take care of our customers in every possible manner. Also, we take their feedback and suggestions time to time for improving our goods and business policies. This improvement helps us a lot in attaining maximum satisfaction of our patrons.